Photographer Rose-Lynn Fisher’s Bee (Princeton Architectural Press) is an other worldly look at one of our most important species: the bee. 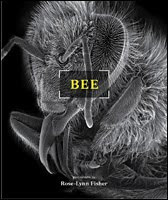 There is little in Fisher’s book beyond bee: these are macro photographs -- some of them magnified as much as 5000x -- that show us bees as they have never before been seen. The resulting book is more like an art installation than a book about bees: you come away from it feeling as though you’ve experienced something you thought you knew in an entirely different way. Bee is a fantastic, unexpected book. There are secrets here. Surprises. And you’ll never see bees in quite the same way. BEE is an amazing book -- not just other-wordly but also an incredible mix of art and science. I don't know of any other book that takes such a remarkable look at the inner landscape of the bee. A miraculous and mysterious peephole into a universe once unseen by the human eye!